Strangers meet in Meow Wolf's House of Eternal Return bathroom. The path of our road trip has been defined, in part, by seeing old friends, and the big turn south and east from the San Francisco area was really about getting to Santa Fe. That’s home to a friend dating back a bit over 40 years, Parris McBride. She doesn’t spend much time with email, and isn’t on Facebook, but she knew we might turn up on her doorstep this week. Having not heard back from my latest email message, we pulled up in front of her home that we last visited about 12 years ago. In one respect, the timing wasn’t great – just half an hour earlier, she had received word of the death of a dear friend back east, science fiction editor and writer Gardner Dozois. And she was awaiting the return of her husband George, who had been away working on and off for a few months. So we sat in their TV room, chatting for an hour, finding out about how our respective families and mutual friends were doing. In an odd sort of way, Parris played a role in my marriage to Bonnie. She was among a cast of characters living in my eight-bedroom Baltimore townhouse known as “Toad Hall” back in the late 1970s. I was interested in her, but she introduced me to her best friend, who eventually became my second ex-wife (but we’re still friends!) just in time for Bonnie – a neighbor early in my first marriage – to turn up again. It’s part of the string of circumstance that against enormous odds creates futures. They’ve both been busy for close to a decade, since George hit it big in the literary and television world… you’ve probably heard of him, George R.R. Martin. 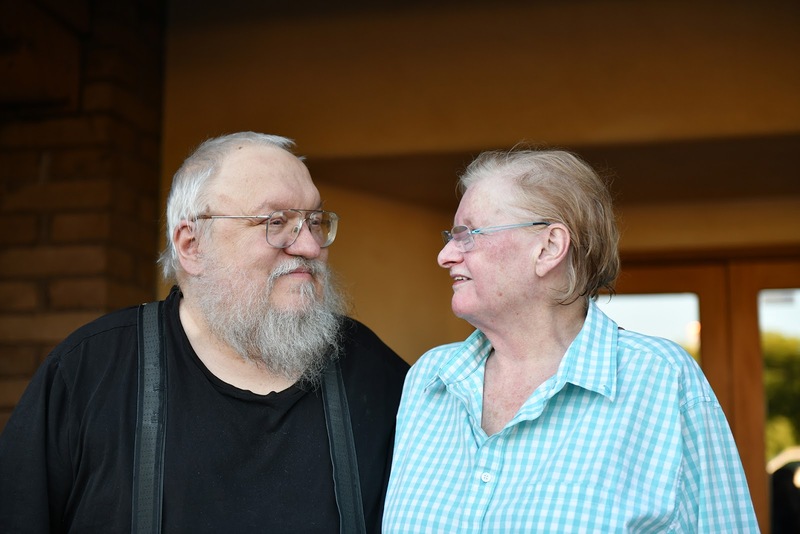 Before his Game of Thrones books and the HBO series based on it, George was not widely known – even in Santa Fe. Now he is a considerable part of the local economy. A new project is the Stagecoach Foundation. As Parris explained it, a wealthy, terminally-ill Santa Fe businessman donated the office building that had housed his former company to George to “do something.” George, in meeting with the millionaire, found he was living in the house on Stagecoach Lane formerly owned by his late friend and fellow science fiction/fantasy writer Roger Zelazny (who for several years lived in the Baltimore area). Hence the name of the foundation, established last year. The building is used as low-cost office space for film and TV productions being made in Santa Fe and across New Mexico, and training and job development in the industry for young people – particularly in underserved and native populations. The project is making up for government cutbacks to subsidies for filmmaking projects under the state’s current Republican administration. And Parris has gotten involved in politics, supporting a Democratic gubernatorial candidate in the upcoming primary election. Bonnie sitting in an alternative reality kitchen at Meow Wolf. On Memorial Day, we arrived about noon to find a line nearly half a block long – and that was for people who, like us, had purchased tickets online ($23 for out-of-state seniors). There was a slightly longer line for those buying tickets at the door. A Meow Wolf staffer said it would have been worse had we arrived at the 10 a.m. opening time, because the line then was more than twice as long. Meow Wolf is sort of a multi-dimensional, other-worldly, family-friendly fun house that takes hours, or even days, to explore. There is inside the huge former bowling alley an entire house whose fictional family, and even the children’s hamster, had vanished, and visitors can search for clues to their disappearance in letters, scraps of notes, physical evidence of all sorts. I may have found the missing hamster. The house has hidden passages leading to other rooms and other worlds, in what seemed a strange cross between the TV series “Stranger Things” and the movie “Beetlejuice.” And for an extra dollar, you can buy 3-D glasses to enhance the experience in many areas of the maze. You can climb through the door of a refrigerator in the kitchen, or disappear down a narrow slide through the door of a clothes dryer. And, if you like, interact with strangers. 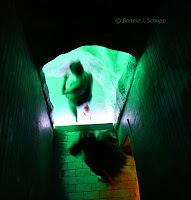 There was a passageway I saw from an upper-level platform, but Bonnie called me away to look at something else. Then I couldn’t find my passageway. I’d lost it, or imagined it. But I really think it was there. I’m not crazy! In the room of eyeballs, only a few are human. Rooms lead to other rooms, corridors, adventures and distractions. Play a Theremin by stroking or moving through red laser beams. Lie back in a room of giant eyeballs (not all of them human). Sit in a green room absorbing the sound of an electronic hum. Take a nap on the bed in a child’s room, maybe even coax a stranger to join you there. Play percussion on the bones of a mastodon. It gets weird. It’s a high-tech “choose your own adventure” in which you are unlikely to find an ending, except for exhaustion from imagination and sensory overload. Bonnie felt the exhaustion after five hours of wandering, but I had to see one more room – the arcade, with an assortment of video games and, in a back corner, one of my favorite pinball machines, Attack from Mars, which I last played in a bar we found in Anchorage, Alaska, about this time last year. But we had to leave – in need of a little relaxation before meeting Parris and George for dinner. We had a feast at an Asian fusion restaurant that was terrific, and talked some more about our lives, friends, and business. I was curious about what George viewed as a key turning point in his life, that in the ensuing decades brought him fame and fortune. He had earned a master’s degree, with honors, in journalism from Northwestern University, but despite a hundred applications could not land a newspaper job. He was even turned down for a job in the comic book industry. But then he sold several short stories, and turned to writing science fiction. He’s also taught writing and journalism at a Catholic girls’ college in the Midwest. 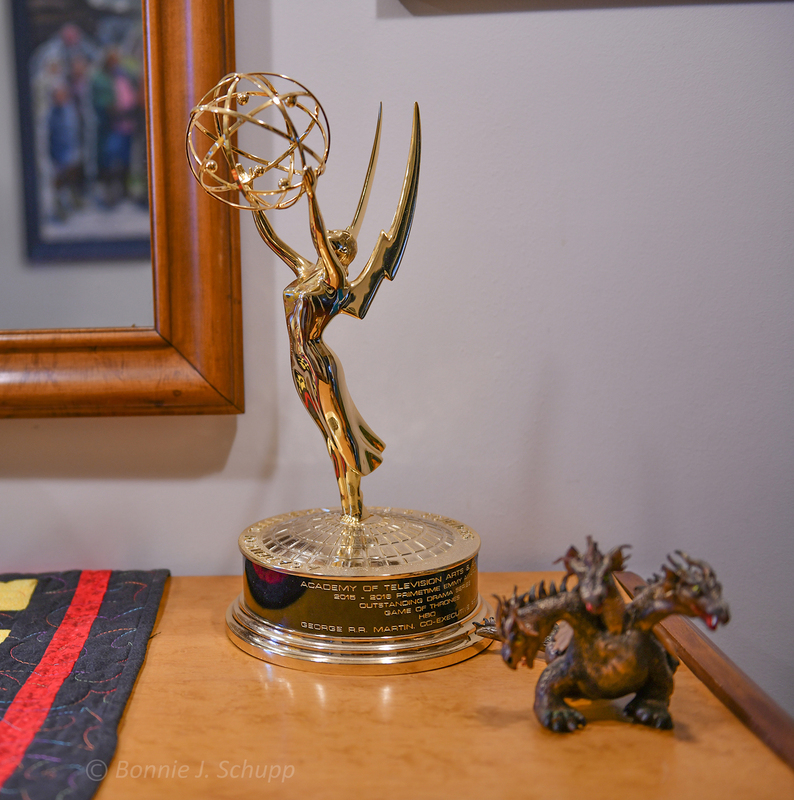 A few years after our last visit, the dragons hatched. The Game of Thrones book series got noticed, books became best-sellers, and HBO’s series rocketed into pop culture. I remember seeing George on TV a couple of years ago at the Emmy Awards, where an usher handed him a typewriter – a gentle jab as fans were clamoring for him to finish the next book in the series. On stage, parody icon Weird Al Yankovic was singing to the tune of the “Thrones” theme music, “write it faster, write it faster.” George looked strangely at the typewriter in his lap, as if some alien device had fallen there from the sky. I had to know whether that was planned or spontaneous. Parris said she had stepped out to the theater lobby for a break and missed it. And George, who had been sitting a few seats into the row, suspected something was up when he was moved to a spot on the aisle. In the back of his mind was the thought that he might have won an Emmy. 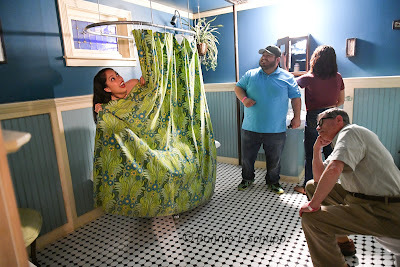 Instead, it was a little humorous mockery. But he’s got a few of the pretty statuettes, one of them standing on a table in the hallway entrance at home next to a sculpture of a three-headed dragon. In his wildest dreams, George said, he could not have imagined the extent of his success. But with it has come demands on his time, meetings to discuss future TV projects, business ventures and other projects, and the pressure to spin out the rest of the Westeros story. It’s nearly summer in Santa Fe, and the world wants the winter emerging letter by letter, line by line, from George’s fingertips. I didn’t ask the question of when winter is coming. Instead, after dinner, Parris drove us up the street to a house they had bought for guest space (in addition to a third house across the street used as an office). 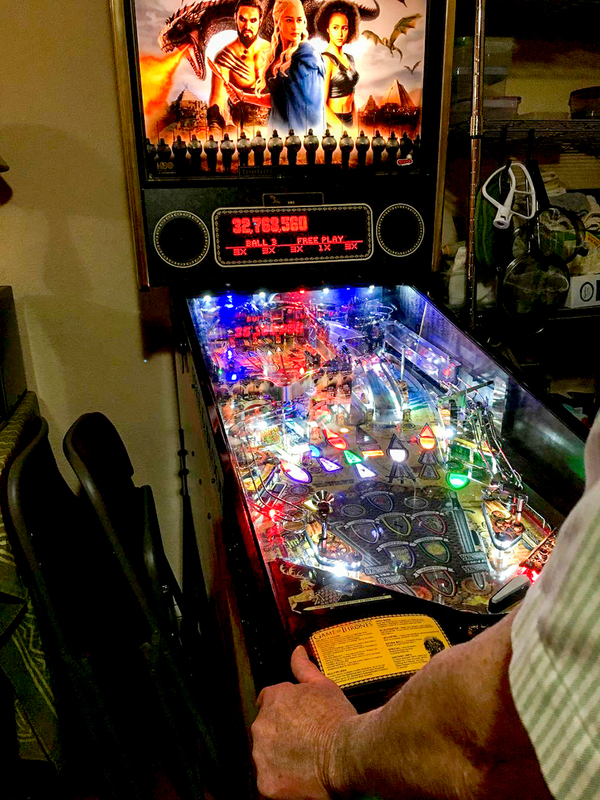 She introduced us to their limited edition Game of Thrones pinball machine. The theme music plays, and character voices are heard as flippers launch the silver balls into a compelling electronic wonderland. 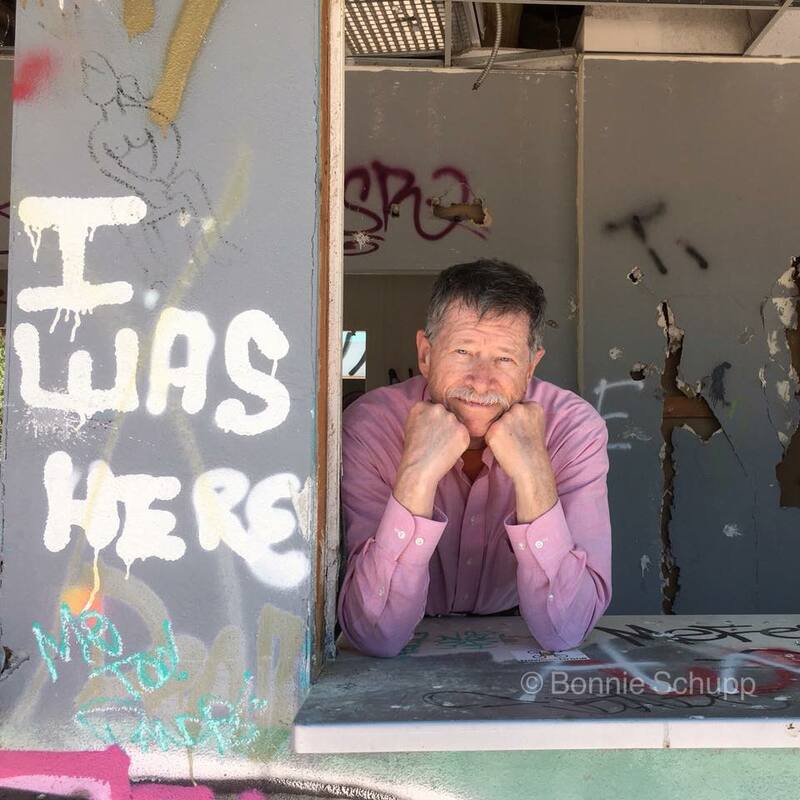 The winds picked up gradually on a long day’s drive southeasterly from Petaluma, crossing vast stretches of sparsely populated land – and was at times howling by the time we stopped for the night in Barstow, Calif. And it damn near crippled me. Getting ready to unload the car near the entrance of the local Holiday Inn Express & Suites, I turned, car key in right hand, to walk into the lobby when what felt like a curb tripped me. Gravity happens fast, and I landed on both knees, my right elbow and the left palm that kept my head from meeting concrete. The wind had blown a large rubber mat behind my right foot. Nothing broken, just pain in four places… and hope that the IHG folks thank me for being so nice and not calling a lawyer. (Like refunding the 20,000 reward points I surrendered for a free night, hint hint….) In the windy conditions so prevalent on the high desert, the mat should not have been left outside. The hotel staff was very apologetic, and the mat was removed… hopefully to stay inside the entrance doors in the future. That said, the motel was excellent. In the morning, we took a little detour in search of a final dose of California amusement in Barstow (Mad Max-style “vehicles from hell” created from wreck parts by a now-dead body shop owner), and then north of the city off Interstate 15, an abandoned water park on a parched back road near the Mohave Desert community of Newberry Springs. The strange assortment of horror vehicles remain behind a locked fence on private property adjacent to an RV park, so Bonnie was limited to photographing them by shooting through and above the metal enclosure. 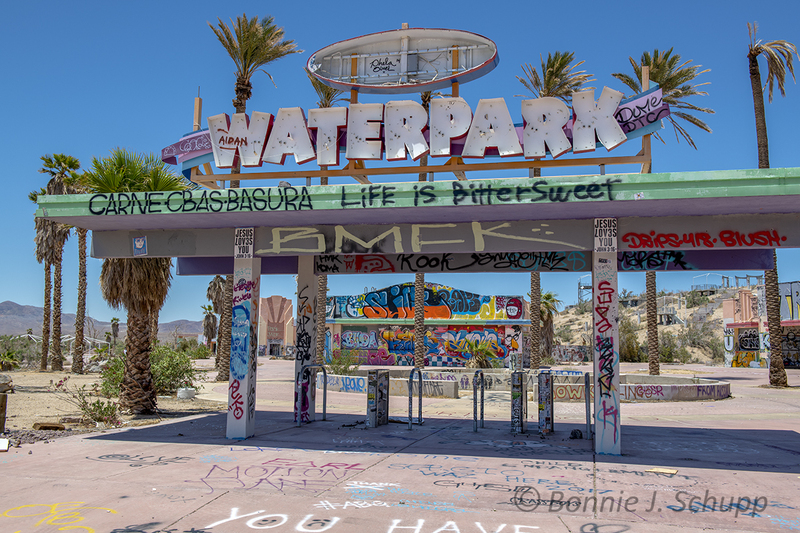 The waterpark is a ghost town, bone dry and abandoned -- and photogenic. 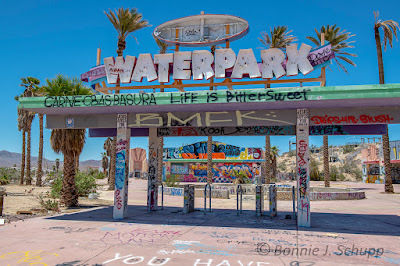 We fared much better at the abandoned Lake Dolores Rock-a-Hoola Water Park, which had opened and closed a couple of times since the 1960s, and went out of business in 2004. Since then, the billboards and structures that housed rides and concessions have decayed and given way to trespassing graffiti artists. The water slide has been adorned with a slope of rocks, and pools are as dry as the climate. It’s eerie, and fascinating – and pretty much open to trespassers, several of whom were shooting photos when we arrived. Bonnie took pictures for more than an hour. 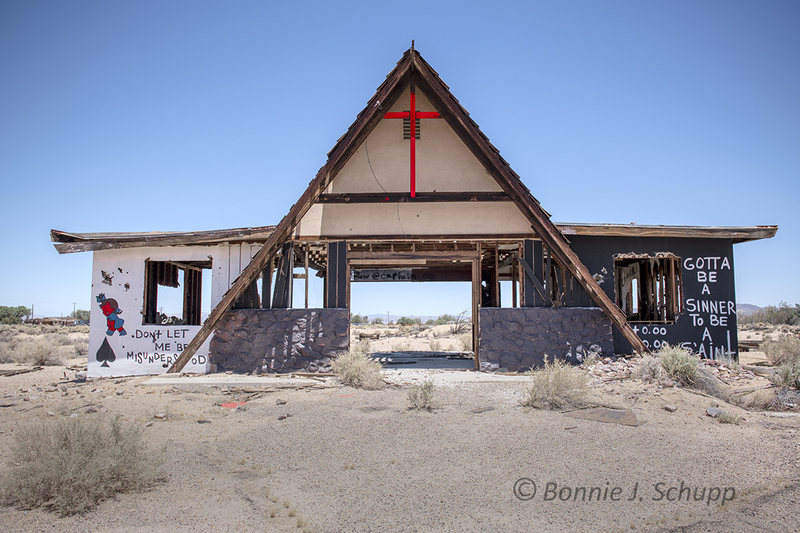 Even the dusty two-mile stretch of road off the interstate had its own ghost, of sorts – a burned-out A-frame building with a large red-painted cross above what used to be the front door. Perhaps it was a church. Inside, there was evidence of its later use, bedsprings and a circle of stones around the remains of a campfire. The ample graffiti includes a large message: Gotta be a Sinner to be a Saint. One thing the area needed, though, was better highway signs. We drove back to I-15 and headed some 20 miles south back to Barstow in order to reach Interstate 40 – only to find as we then headed east an exit for Newberry Springs that could have saved us at least 50 miles of driving. But at least we were headed in the right direction, and after about 130 miles of mostly desert scenery later crossed the state line. We called it a day at a Days Inn, in Kingman, Arizona., about $70 cheaper than the Holiday Inn Express. There was no AAA discount – its contract had been discontinued, the owner said, but then offered an even better AARP discount even though we aren’t members. It was clean, relatively comfortable, and included a modest continental breakfast. Some nights, luxury be damned. 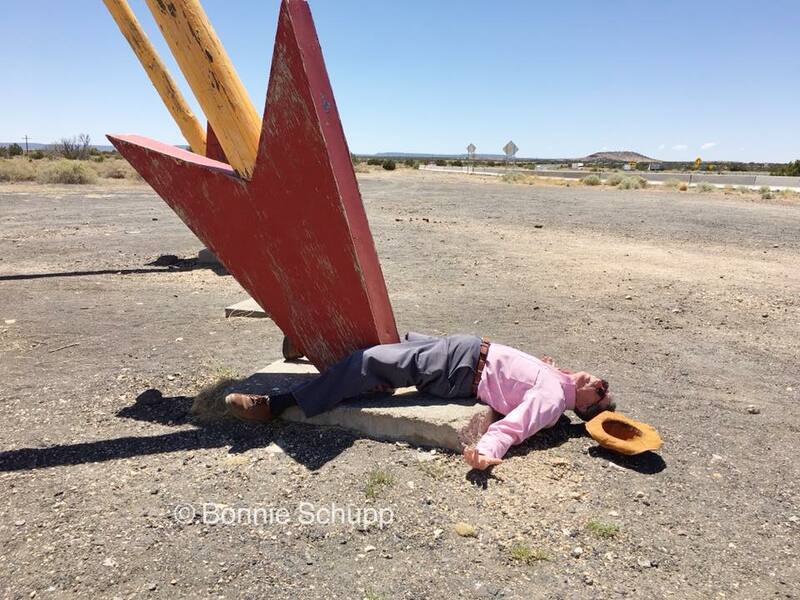 When you’re a fan of the bizarre, it’s impossible to drive quickly across Arizona – particularly on I-40, which runs parallel to and sometimes overtakes the quirky old U.S. Route 66. 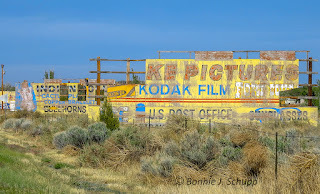 The interstate took away much of the business from the motels, restaurants, gas stations and trading posts that lined the old highway, and are now largely abandoned. In many spots, the oddball remains are luring people back, if only long enough to walk around and take pictures. 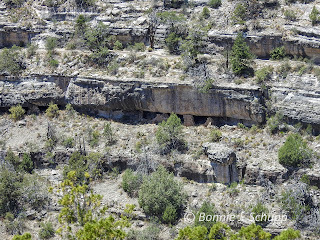 Cliff dwellings are visible in walls of Walnut Canyon. Our first stop, though, after a bigger breakfast in the town of Williams, was Walnut Canyon National Monument. It seemed a chance to make use of our lifetime seniors national park pass, but the usual admission price of about $10 had been waived because of extreme fire danger closing a major walking trail. We took a three-quarter-mile stroll along the open rim trail, where ample signs identified trees and plants, explaining how they were used by the Native Americans who had inhabited the area centuries ago. 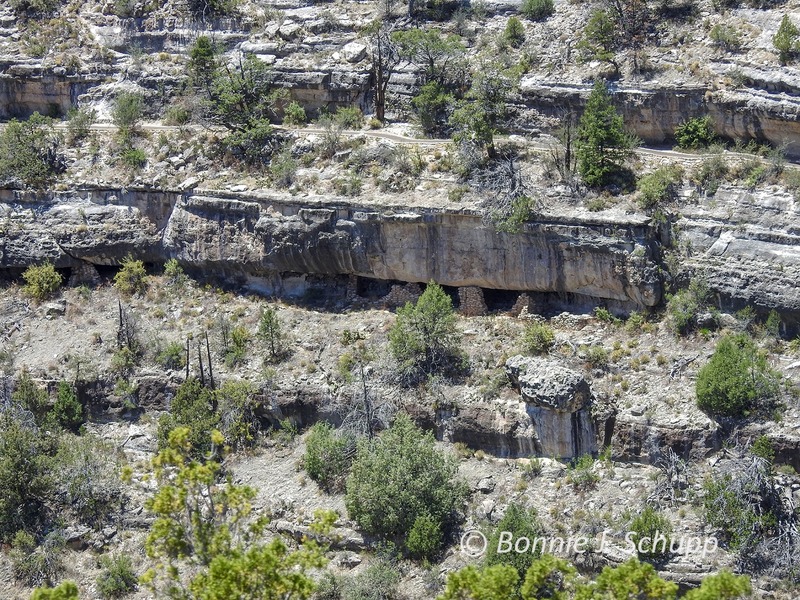 And visible, distantly, from the canyon rim were cliff dwelling remains on the other side. We had another alternative, of course – taking one of the roads leading to the Grand Canyon. But on the Friday of Memorial Day weekend, that huge attraction would obviously have been crowded, and we’d been there before. Instead we got a little canyon, nicely managed by national park rangers, and were back on the road an hour later. 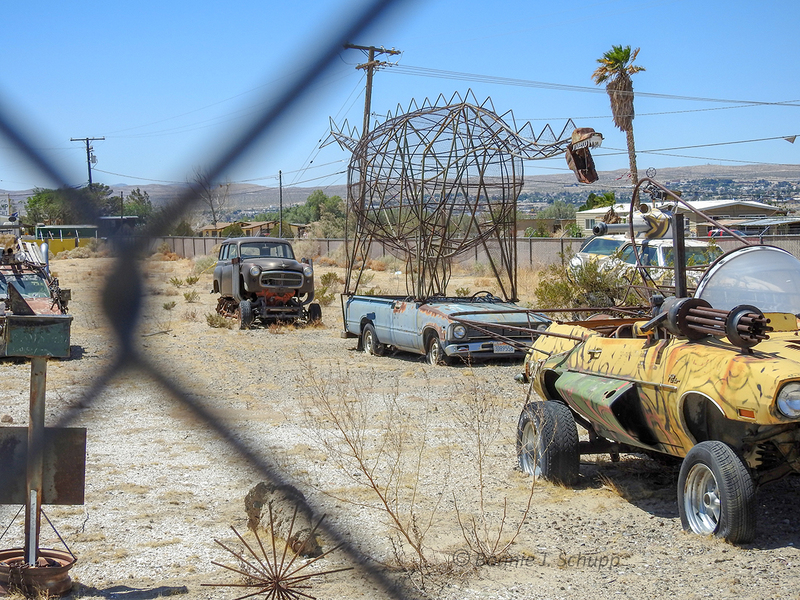 The quirky fun included stops at ghostly remains of the Route 66 heydays at Twin Arrows and Two Guns, which are about five miles apart and just off Interstate 40. Twin Arrows was a fuel stop and trading post back in the day, but the gas station and café are abandoned, decaying and, of course, decorated with graffiti. And there are two giant wooden arrows, their tips seemingly stuck in the ground. Nice picture, but whoa! – we watched a pretty young woman stretch out on the ground as if the arrow had taken her life, while her boyfriend took pictures of the scene. So I couldn’t resist my own version, lying down with my legs spread and the huge arrow seeming to have hit an unspeakable target. It was one awful splinter! Oh, not that! Trying to get up after Bonnie took a few shots, I tried holding onto the sides of the arrow to pull myself up and got a splinter in my finger. Call it suffering for art! Two Guns was more elaborate. It once had a campground, pool, restaurant, gas station, and even a display of live mountain lions. Bumpy dirt, gravel and asphalt lanes make it possible to drive around the complex, park and get out to appreciate the remains of it all, including an archway bearing the words Mountain Lions. And down the steps behind the arch are two cages where the lions were kept. Driving along the highway, there are so many sights that you just can’t stop for all of them, so we passed up Meteor Crater. But we did stop in Winslow, a town we had passed through many years ago. I just wanted to stand on a corner and take it easy for a few minutes. Lots of other people had the same idea, so I tried to assemble a crowd of standees for a group photo. But the angle of the bright sun did not help, so I walked across the street and found Karen and Dave (Santa Swanny) Swanson of Chula Vista, Calif. (he works for the San Diego Maritime Museum to support his Santa Claus habit, and, like Bonnie, she's a retired middle school teacher). They were doing what you do on a corner in Winslow, Arizona. So we took pictures of each other and all of us together, had some laughs and then headed our separate ways. But we exchanged cards first. I suspect we’ll be in touch again! 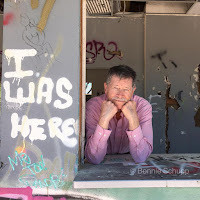 There was yet one more stop, in the community of Houck, as we neared the Arizona-New Mexico border. 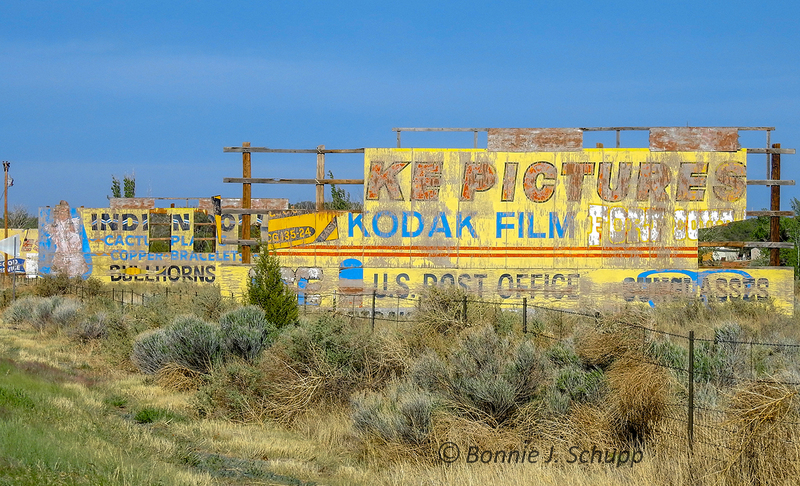 It was a dirt road lined with weathered billboards, mostly for a now-closed trading post on the other side of the interstate. They were, in a sense, American and Native American art objects in their ruined state, and spoke of bygone days. One even pitched taking pictures – with Kodak film. Bonnie shot it with, of course, her digital camera. About 40 minutes later, we checked in at what might be the most luxurious Holiday Inn Express & Suites in America, in Gallup, New Mexico. We had made the reservation by phone from the car, burning up 20,000 more reward points. As a “platinum member” I asked if an upgrade were available, and we ended up with a king executive suite so spacious it had a long, curving work desk. And the just-baked chocolate chip cookies in the lobby were scrumptious!